I found a rare photo shoot from the air ! It's the first time i see the Norway from this view ! Very nice photo from Great Stirrup Cay... I wish we had a better close up of the ship! From Lionel , who work onboard the s/s FRANCE . NEW YORK in 1972 seen from the s/s FRANCE ! Jan-Olav, I saw you commented to this photo on fb which I posted and a "friend" uncredited. I thought Id share it here for you and the members to look at. Enjoy. 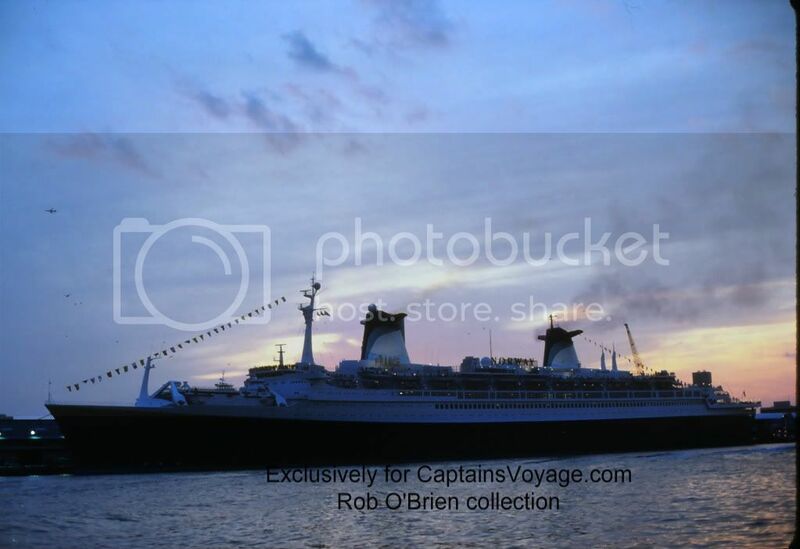 This is our beloved NORWAY in Miami during her cruises where the ship was reliving her days as FRANCE, hence the nameboard- tempoarary- under the 1s funnel. Not sure if this 1987 or after I have no exact date. Last edited by Captain RJ; December 23rd, 2011, 18:02. The first French Charter was Dec 1989. I believe it was the first week of Dec. I really miss her - more than anything/ anyone else. If you forget just they 2 little Norway on this photo , you have the " sensation " to see the real s/s FRANCE !!! Last edited by france-norway; January 27th, 2012, 18:03. It is so TRAGIC that she is no longer sailing - or kept. It makes me so sad to think that she is now all gone. NORWAY, which in my opinion, was one of the most beautiful cruise ship ever built, had his last visit to Bergen, Norway, 18 August 1998. Here are some photos from the departure in the afternoon. Such cruise ships will never be built more - unfortunately. Beautiful shots... are these your images, and if so, may I use them on the main page ( www.CaptainsVoyage.com ) ?